Erhun Oztumer was excellent for Posh in the first half of the season. Photo: Joe Dent/theposh.com. Peterborough United’s season is almost over so votes will soon be cast for the club’s player-of-the-season. Marcus Maddison is the most talented played in the Posh squad. Photo: Joe Dent/theposh.com. Amazed he was barely mentioned by the Posh fans when I asked for nominations. It must be because his best form arrived before Christmas whereas Harry Beautyman (who has won nominations) has been at his best in recent matches. There was a spell in November when the Turkish Messi was living up to his nickname. His busy, creative style was wowing opposing fans as well as Posh suppoters. Michael Bostwick is one of Posh's most consistent performers. Photo: Joe Dent/theposh.com. He scored brilliant goals at Gillingham, Coventry and Sheffield United and was probably Conor Washington’s favourite team­mate as they linked up so well. Oztumer’s form has faded and it’s no co­incidence it dipped when Washington left. Best performance: v Oldham (away). Callum Elder is one of the best ever Posh loan signings. Photo: Joe Dent/theposh.com. Even in Fergie’s glory years Posh didn’t have a quality left­back. There probably hasn’t been a consistently good one since Adar Drury left for Norwich in 2001. Well there has now and what a shame the Leicester loan player picked up an injury on Blackpool’s appalling playing surface which knocked him out for the season. Elder was born to play in a midfield diamond as his energy and speed enables him to get up and down the pitch with ease. Crucially his pace didn’t come at the expense of his quality. He’s a brilliant crosser of the ball and he would have been a number one player­of­the­season contender if he’d stayed fit. My player­-of­-the-­year last season when he finished the campaign with a string of dynamic midfield displays. There is no doubt now though that ‘The Boss’ is best at the heart of the Posh defence. He’s not quick and he’s not particularly big for a centre­-back, but he is powerful, tough in the tackle and he reads the game well enough to compensate for that lack of pace. A quite brilliant penalty-taker as well (apart from the one at Fleetwood recently), easily the most reliable since Grant McCann stopped taking them, but then any goalkeeper getting in the way of his blistering shots could well lose a limb. Best performance: v Wigan (away). If the sign of a good player is how badly he’s missed when he’s out of the team, then this striker should probably be player­-of-­the­-year at the ABAX Stadium. His sale to QPR was solid business for Posh, but his departure in January co­incided with a shocking slump in form. Washington improved leaps and bounds under Westley to become a lethal finisher, a scorer of all sorts of goals and a tireless worker. He’s been missed, particularly by Oztumer who had developed a great understanding with a striker who was on a run of 13 goals in 14 games when the Championship came calling. Best performance: v Scunthorpe (away), first hat­-trick of his career. Dave Robertson’s farewell gift to Posh was a beauty. ‘Robbo’ signed a midfielder who has progressed from a no­body (in Football League terms) to a pass­-artist who almost gate­crashed Ireland’s Euro Finals squad. This was all achieved in an unfamiliar poisition of holding midfielder, an unfamilar country, and an unfamiliar lifestyle for an unashamed home boy. Excellent in possession even under the greatest of pressure and a shoo-­in for player-of­-the-season 2016­-17 as long as a) he stays injury­-free and b) he isn’t sold. He’s been on the go non-stop since January 2015 so a fresh Forrester could be a sight to behold. Best performance: v Doncaster (home). I don’t understand why so many Posh fans have a downer on the most naturally ­gifted, most entertaining player in the squad. It must be the alleged diving and theatrics whenever he’s tackled/fouled. He’s always been a scorer of great goals, but this season he’s added many goal assists which suggests selfishness is a thing of the past. 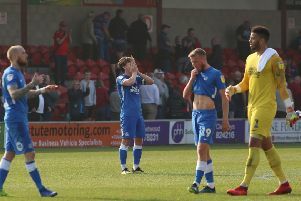 Maddison was great when Posh were struggling at the start of the season under Dave Robertson and he was great when they were struggling under Graham Westley more recently. Ignore his moody look and the sort of tumbling Louis Smith would be proud of, and revel instead in his flair and fancy footwork. Eleven goals and 15 assists is a fine return for someone who has missed so many games. Best performance: v Chesterfield (home), as a left­-back.